A couple of months back, this lovely lady photog, Sheradee Hurst, came to me with a dream of conquering a styled wedding shoot together. I say conquering because this is no project for the weary. A joint venture and vision was born. We had been toying with the idea of working together for awhile, so this is the first big step in a wonderful partnership! Since then, an amazing list of vendors have generously joined the party. From location & floral design to cake and the overall bridal look (makeup, nails, hair & jewelry), everyone is in place and ready to rock this shoot! But since I’m not at liberty to divulge anything specific about the shoot, let’s look at what to wear to a wedding, all female parts played out here. The main attraction: It’s the bride everyone is waiting with excitement to see. This is why picking the dress is typically accomplished at the very beginning of planning. Other than date and venue, it’s the most important piece on the big day. (FYI, that’s how it goes for styled wedding shoots too!) I’d die twice to wear one of these gowns if I had it to do all over again (with my beloved Patrick, of course). The first is the loveliest work of art with it’s silk white embroidered tulle. It’s the “Illusion” gown by Monique Lhuillier. I swear she’s floating in this gown. The Jenny Yoo “Annabelle” dress is gorgeous and perfectly compliments a romantic-looking wedding gown. And even though every bride says it, but it’s only sometimes true, this style is a great choice for all the bridesmaids because it can be styled 15 different ways with the coordinating sash that blends into the long skirt. Each bridesmaid can add their own twist to this look by switching up the sash. It’s offered in nine different colors, and can be found at www.bhldn.com. What about short? Here’s one that I love. And more than the cut, I really love the berry color. I just want to eat it! Please do have a taupe bridesmaid dress, but if you just can’t, this also comes in black. I love this asymmetrical gown from Tadashi Shoji. It’s stylish and modest, and it has a beautiful and fun neckline. A major plus, too, is that it has some great ruching for those moms desiring a midsection disguise. It’s a gorgeous and classic indigo blue and the true icing on the cake is that it can absolutely be worn again. This is great for any formal event (gala, charity dinner/auction, etc), any season. This dress can look a lot fancier with the right jewels and shoes for extra pizazz. Perhaps the only possible trump card in the princess processional is the flower girl, capable of (and likely to) stealing the show. Her princess dress (along with the sheer will and mind power of moms, grandmas and guests alike) plays a major part in instilling confidence and fueling excitement and hopefully focus for getting her down the aisle without any tears, pit stops or mishaps. Wedding Guest: The guests have it the easiest on the big day. Dress up, show up (a little early, please) and enjoy the show that has been the heart and soul, blood, sweat and definitely tears of the lovely bride for the past year or so. 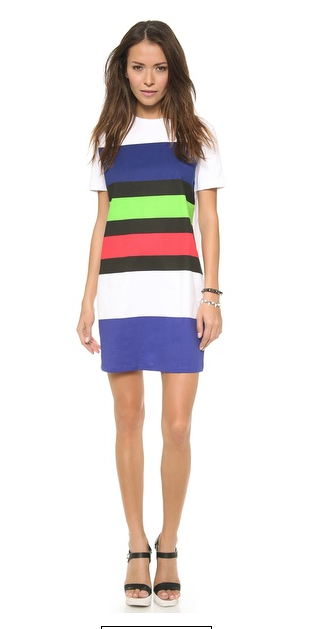 This DKNY scuba fit and flare dress is so cute! Picture it with black sandals and a smile. You can find it at Saks. Oh, it’s formal? No worries. This gorgeous red dress by Giambattista Valli is just inspiration for you, given there is only one left. You can see why. It’s amazing! Okay, so that about wraps it up. I’m sure I’m forgetting someone, but the major girl players are covered. Until next time, have a ball getting dressed! In my spring dream, regardless of weather or budget, this is my clothing menu for the week. That’s it for “Seven Days of Spring.” Warmer weather is just around the corner, but you probably still have a day or two to get your outfits together. Have fun shopping! I have to admit, I love a good polkadot or stripe. I don’t often get more adventurous than that when it comes to patterns and prints. I would like too, though. Here are some great pieces to get you thinking in that direction. What a fun top! I love the splatter of blues on white. 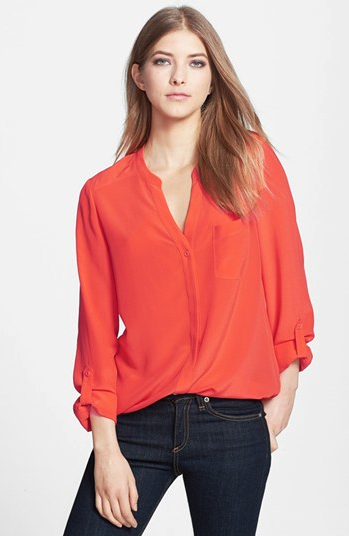 The frilly sleeve and hem add adorable detail. I think this will be so cute with blush denim and booties, like the picture below. 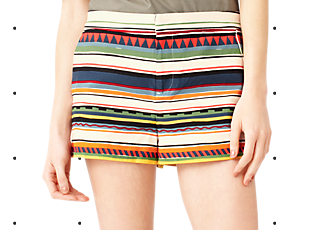 These shorts are cute, but not nearly as cute as when they are paired with the red blouse (am I obsessed with red blouses?) below. 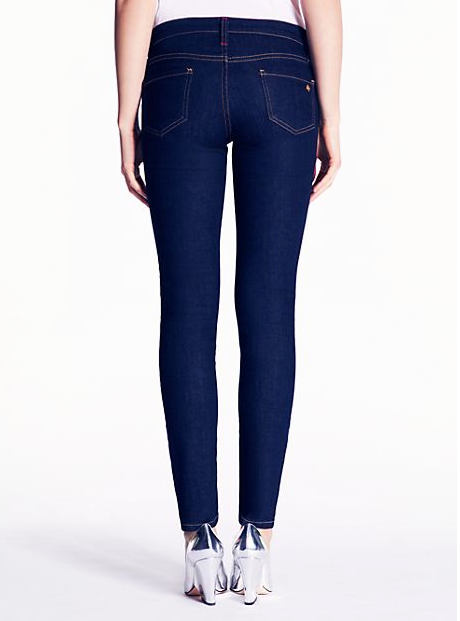 I can also see these with a denim button down or a silky black button down. This is an easy pick. It’s just so comfy, yet super pulled-together looking. The options for shoes that would go with this are endless. Throw a cardigan over this until it warms up, but go ahead and purchase. Oh yellow sweater, I have a crush on you. This floral patterned sweater is so cute! And I love it with these white shorts. 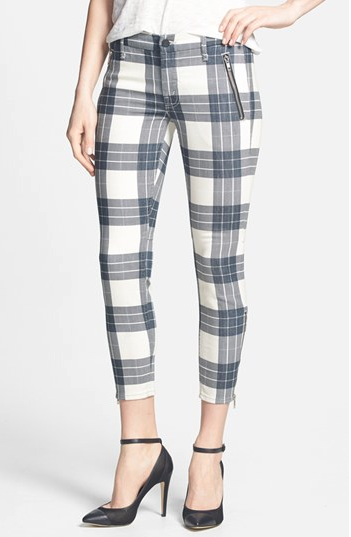 It will also be great with dark denim skinnies, a full skirt or even the first pic on this post (plaid pants), if you’re feeling brave enough to mix prints! Just do it. 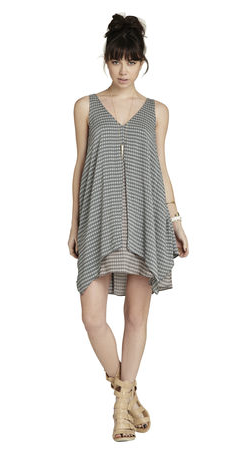 It’s a super cute, big stripe dress. What’s not to love? I like it with wedge sandals or flat sandals. You could even wear this with flip-flops if you’re going super casual. I have too many favorites in this post because I really want to urge you to buy this dress too. It’s drinks with the girls and brunch on Sunday. In fact, just sleep in it. love, love, love! The simple necklace it’s styled with is just icing on top of this perfection cake. So that’s it for patterns and prints. I hope you feel inspired to infuse some prints into your wardrobe this spring. Everything in this post can transition right into summer. Can’t believe this was day six. Fastest week ever. Until tomorrow, my friends. With all the lace new spring lines have to offer, how could you choose just one? I remember when I was pregnant with my first daughter and my mother-in-law, who only had boys, innocently asked me, “How many days can she wear pink?” I said, “Everyday.” I feel similarly about lace. 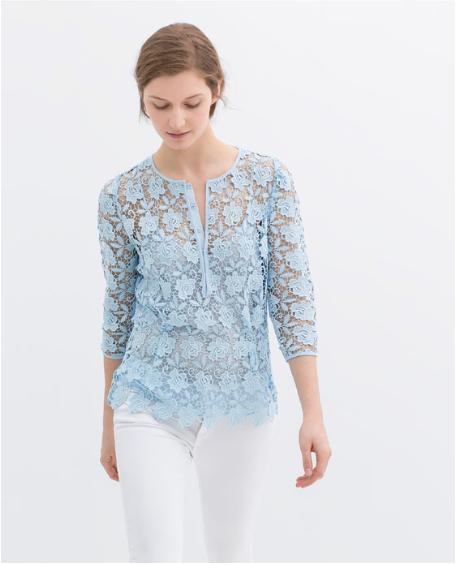 I love this sky blue lace top from Zara. How gorgeous would it be under the navy blazer below? I know it’s a lace post, but I had to show this blazer because it’s so adorable with gathered shoulders and gold buttons on the sleeves (also from Zara). Red for spring is just lovely. 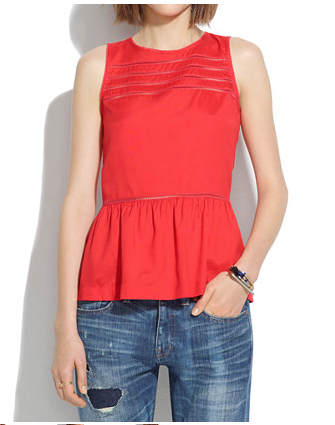 I love this Silk Peplum Veranda top with delicate lace insets from Madewell. They have it styled with denim, which is perfect, but this top will also go amazing with a pencil skirt or cigarette pants. Look at the sleeves on this Pretty Skater dress from ASOS. This easy, comfy look will be so cute with booties right now and adorable with sandals later. 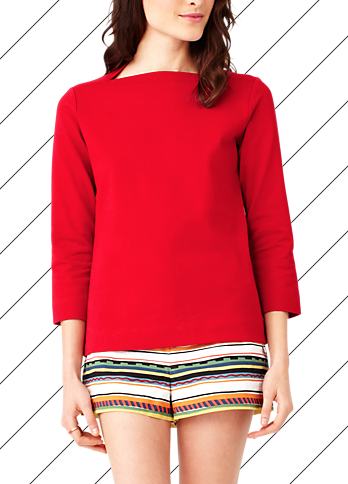 This Isabel Top from Tory Burch is another goody! 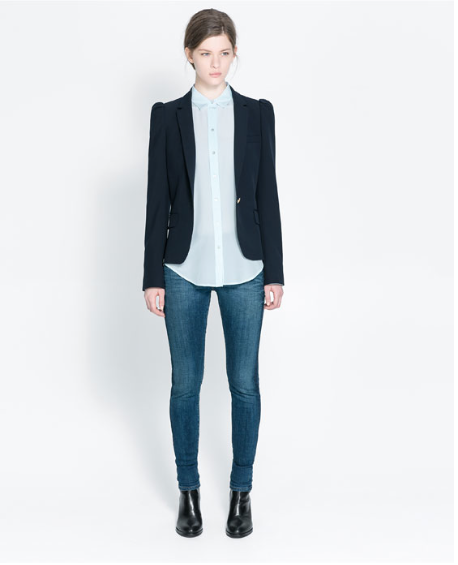 They styled it with a button-down underneath, which looks fab. It will be great by itself too, with slacks, denim or a skirt. 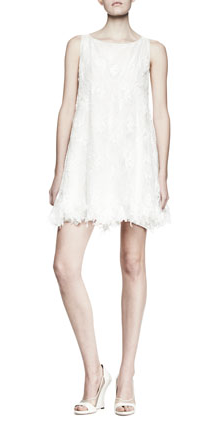 Look at the adorable polkadot organza lace on this fit-and-flare dress from Red Valentino. Too cute and perfect for any special occasion. Find it at Nordstrom. 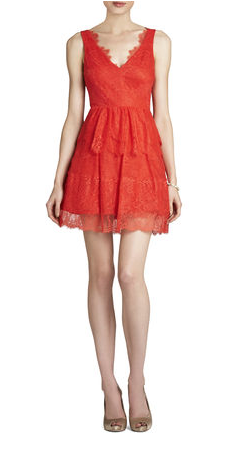 The amazing neckline on this BCBG Little Red Lace Dress is so exciting! Switch it up. Wear red instead of black to your next cocktail party! The gorgeous citron color of this Heavy Lace Bambolina Dress by Valentino is so yummy. It reminds of me of key lime pie. The scalloped neckline, sleeves and hem are beautiful. And I love the natural waist and tulip skirt. Perfection. Find this dress at Neiman Marcus. I chose this Monique Lhuillier cocktail dress because of the rich color, the beautiful high, boat neckline and the sleeve length. It was proving harder than I thought to find a lace swing dress I loved. Then, I stumbled upon this Sleeveless Baby Doll Dress by Nina Ricci. It’s great because most of the lace dresses are fit-and-flare or sheath. The hemline is my favorite part…it totally makes the dress! Find it at Neiman Marcus. Let’s talk about wearing patterns tomorrow. It will be so much fun! What more could you want for blue inspiration? It was far and away the most gorgeous look of the night. This “Nairobi blue” Georgette Prada gown was magnificent on the red carpet and equally amazing for her humble acceptance speech. From the full skirt to the train to the plunging neckline in front and back, this is blue perfection. Ahhhh, navy. Possibly the best shade of blue ever. Navy lace? Even better. Where are you wearing this look? Everywhere: spring (or summer) wedding, brunch with friends, work, a wine tasting, the theatre, everywhere. 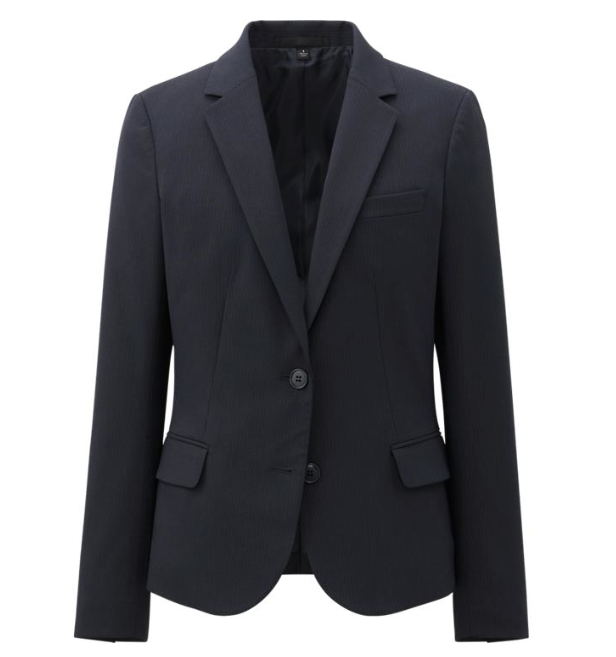 You can’t get through spring without a navy blazer. This is a closet staple you can’t skip. It’s so cute over a white top and jeans with a chunky gold statement necklace or add a bit of color with a red, yellow or green clutch. 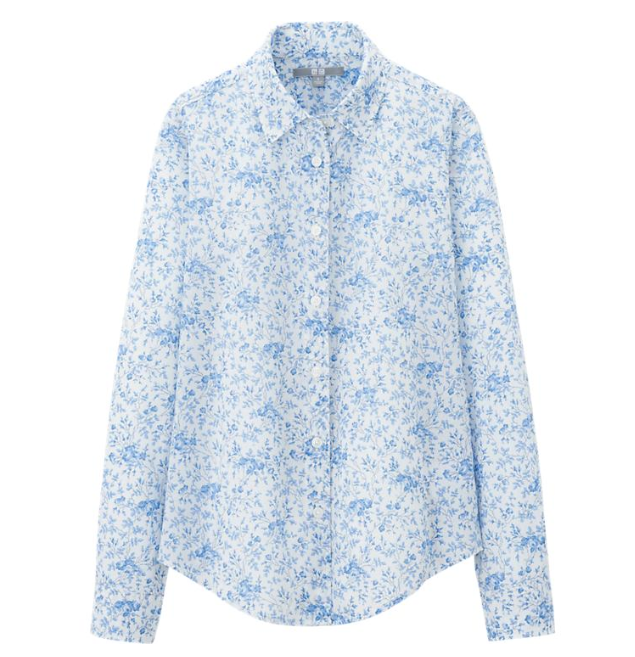 Wear this sweet blue floral with the blazer above and your favorite jeans. Switch it up and pair it with capris or a pencil skirt. 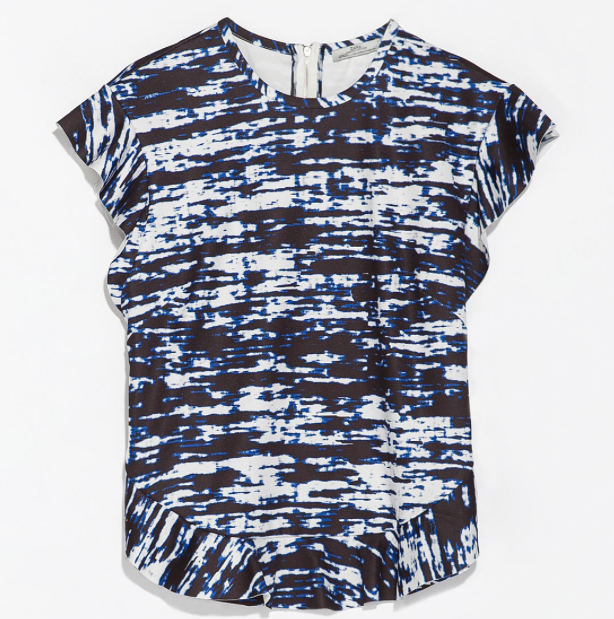 This shirt goes with everything, even stripes and polkadots. 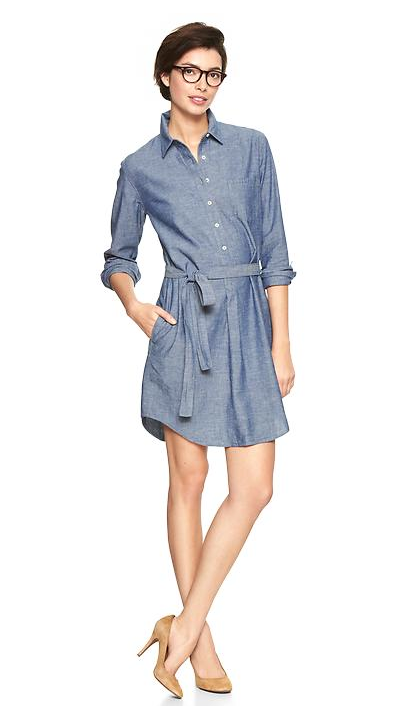 Everyone needs a chambray dress. Running late? Throw it on for any “everyday” occasion, even work. It’s adorable, comfortable, versatile and fun. Make it yours. My favorite reaction to clothes is, “Are you serious?” It might mean, “I love it.” It might mean, “That’s the worst thing I’ve ever seen.” In this case it’s I LOVE IT! Don’t you? It’s so unique and wait for it…will go with everything. I’m sensing a trend with blue. 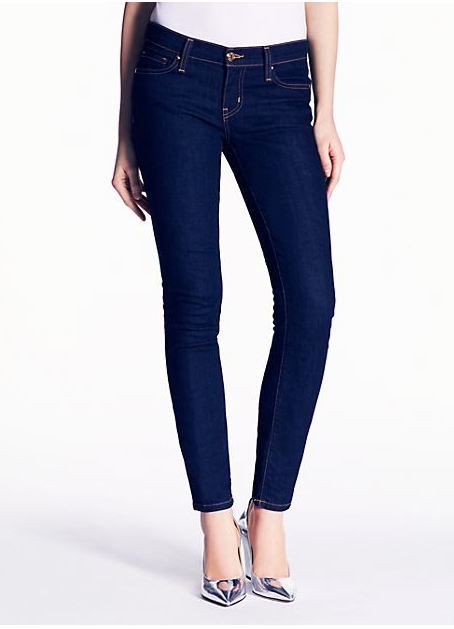 My most frequent blue of all: Denim. And these are my all-time faves. I own them, my sister owns them and some of my clients own them. There aren’t many people they don’t look fantastic on.